Bottomless mimosas that aren’t a race to the bottom—and other fine discoveries. 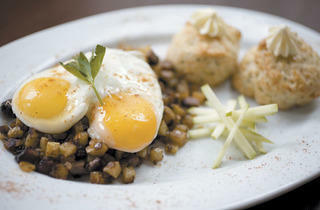 Photograph: Martha Williams Kobe brisket hash with cheddar-chive biscuits at Chicago Q. The food? Now that you mention it, there was food. 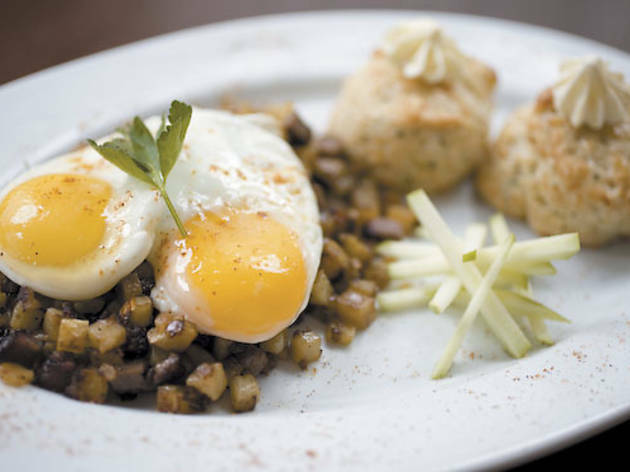 Turns out French chef Martial Noguier serves the same items for brunch everybody else does. We had a short-rib hash; it was less a hash than a plate of stewed braised short ribs topped with eggs. We liked, but did not love, it. We had eggs Benedict: English muffins topped with thick slabs of Canadian bacon and big, runny eggs. Knowing Noguier (but not, you know, personally), we expected a light and bright hollandaise. We expected correctly. Speaking of expectations, given chef Lee Ann Whippen’s pork forte, we were shocked to find there’s nary a squeal on her five-item brunch menu at Chicago Q (1160 N Dearborn St, 312-642-1160). So we made do with Kobe brisket hash instead. The two cheddar-chive biscuits on the plate were Red Lobster–level addictive (not that we know about that), and their delicate, flaky tops and fluffy interiors warranted a napkin-wrapping, purse-stuffing moment (not that we know anything about that, either). Alas, the behemoth pile of custard-dipped Texas toast stuffed with cinnamon-and-vanilla-spiked mascarpone was too big and messy for a purse. But it did make us forget about pork. Though here’s a tip for anybody who’s really, really jonesing for pulled pork on a Sunday morning: Ask for the lunch menu. What’s the difference between lunch and brunch anyway, are we right? Like, if you take away the egg dishes, and the French toast, and maybe the burly slices of smoky “bacon steak” (it really is like eating a marvelous pork chop in miniature) at Autre Monde (6727 W Roosevelt Rd, Berwyn, 708-775-8122), you’re left with a beautiful selection of Mediterranean plates that have a definitive lunchiness. A delicate crêpe filled with chicken, fontina, olives and fiery harissa, for example. But who are we kidding? This is an occasion for that bacon, or the massive French toast made with sliced panettone, or a cazuela of eggs, chorizo and potatoes (though it was hard to appreciate the latter because the eggs were seriously undercooked). A duo of hummus and fava spreads? Don’t get us wrong, it sounds great. But is it too much to ask that there be an egg slapped on it?